Debussy Remembered. Roger Nichols. Amadeus Press. 1992. ISBN 0931340411 (hardcover). 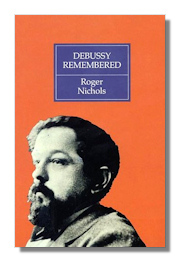 An anthology of vivid and revealing memoirs that includes recollections from a wide range of Debussy's friends, colleagues, and acquaintances. Claude Debussy and the Poets. Arthur Wenk. University of California Press. 1975. ISBN 0520028279 (paperback). Debussy Letters. Claude Debussy. Harvard University Press. 1987. ISBN 0674194292 (hardcover). A Portrait of Claude Debussy. Marcel Dietschy, et al. Oxford University Press. 1994. ISBN 0193154692 (hardcover), 019816419X (paperback). This translation of Marcel Dietschy's landmark biography of Claude Debussy makes a wealth of information available for the first time in English. Hailed upon publication as one of the most "authoritative" biographies of the composer and "an invaluable and reliable source of reference," this book offers many previously unpublished facts about the composer and his work. With painstaking attention to detail, Dietschy unearths documents about everyone connected with Debussy – in particular, much hitherto unknown information on the composer's family – producing the most accurate account to date of Debussy's life. Seamlessly weaving a clear, jargon-free assessment of Debussy's musical works with an unparalleled account of his life, Dietschy offers a deeply sensitive and sympathetic approach which yields many fresh insights into Debussy's complex personality. In rendering their beautiful translation of this now classic biography, William Ashbrook and Margaret G. Cobb have been able to make a number of corrections, including Dietschy's own list of Errata, not incorporated into the original French edition, La Passion de Claude Debussy (1962). They have also updated the Bibliography and List of Works, and have been able to include information about recently discovered manuscripts. An essential addition to the library of all concert-goers and music lovers, A Portrait of Claude Debussy offers new insights into the life and work of one of the greatest of the nineteenth century French composers. Teaching Genius - Dorothy DeLay and the Making of a Musician. Barbara Lourie Sand, with Zubin Mehta, foreword. Amadeus Press. 2000. ISBN 1574670522 (hardcover). "Teaching Genius" examines the personality and teaching methods of Dorothy DeLay, the first woman and the first American to have been accorded a place among history's great violin pedagogues. Included are observations and recollections of famous musicians associated with her including Itzhak Perlman, Isaac Stern, and others. Delius: A Life in Letters. Lionel Carley (Editor). Harvard University Press/Scolar Press. 1984/1988. ISBN Volume 1 (1862-1908) 0674195701 (paperback), Volume 2 (1909-1934) 0859677176 (hardcover). Carley has gathered correspondence from Delius to the likes of Grieg, Ravel, Richard Strauss, Beecham, Vaughan Williams, Fauré, and Grainger and has published these letters for the first time as a group. The volumes also includes numerous rare photographs. The letters follow Delius' career by providing his own perceptions of biographical and historical events in the composer's life. Frederick Delius. Sir Thomas Beecham. Alfred A. Knopf. 1961. ISBN (paperback). Written to fulfill a pledge made to Delius's widow. This outspoken biography is interesting because of the light shed on the musical partnership of composer and conductor. Gaetano Donizetti - In the Light of Romanticism and the Teaching of Johann Simon Mayr. John Stewart Allitt. Element Press. 1991. ISBN 1852302992 (paperback). Gaetano Donizetti - A Guide to Research. James P. Cassaro. Garland Publishing. 2000. ISBN 0815323506 (paperback). The Songs Of Henri Duparc. Sydney Northcote. Reprint Services. 1949. ISBN 0781295955 (paperback). Dvořák in America 1892-1895. John C. Tibbetts (Editor). Amadeus Press. 1993. ISBN 093134056X (paperback). Dvořák and His World. Michael Beckerman (Editor). Princeton University Press. 1993. ISBN 0691000972 (paperback). Dvořák. Alec Robertson. Dent. 1969. ISBN 0460031163 (paperback). This is part of the Master Musicians series, edited by Stanley Sadie. It is a very good biography and a careful review of the compositions of Dvořák, meant for the general reader.